Why is NZ more corrupt? New Zealand has slipped again, to fourth, in the latest anti-corruption global rankings. NZ was 1st in 2012 and 2013; 2nd 2014 and now fourth. But no explanation of why is provided. Maybe NZ stayed the same and Denmark, Sweden and Finland improved? Here's the site that rates the countries for corruption. 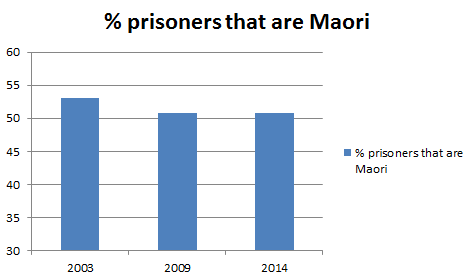 NZ's conglomerate score suffers from a lower ranking in "Rule of Law" measured by another organisation. Here NZ is only 6th of 68 countries. 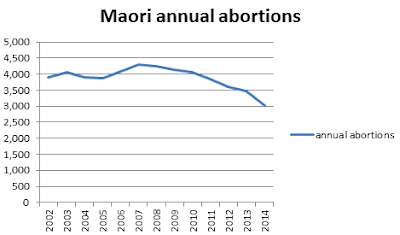 Additionally, a poorer score from "Sustainable Government Indicators", arising largely from a low ranking on environmental policy it would appear, has added to NZ's drop. Water management and use and greenhouse-gas emissions have been a focus of policies in recent years. Deforestation has been addressed with an effective permit system. Critics say the government has failed to resist agricultural-industry pressure, but all recent governments have been active in protecting biodiversity. 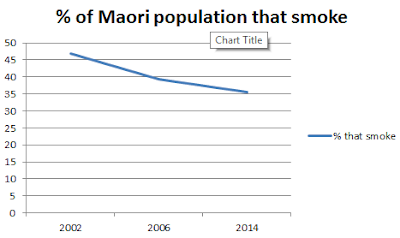 While New Zealand withdrew from its original commitments under the Kyoto protocol, it is working toward its own independent emissions-reduction goal. There you go. That's what has contributed to us becoming more corrupt. A Blenheim single mother of three finds she is only $34 better off working. She says, "When you weigh it up, is it worth going to work? The Government is trying to get everyone off the benefit but there is no incentive to work." The incentive lies in being self-supporting, in joining the workforce that creates the productivity and taxes to pay for, among other things, benefits for those who genuinely can't support themselves. "There is that stigma attached to being on the benefit and many believe that you are just a bludger," she adds. Only if you can work and refuse to. In any case, she goes on to answer her own question: "I love my job. It makes me feel rewarded." Time for a reality check. Because of the accommodation supplement and family tax credits, the gap between benefit income and income from work is very small (and will get smaller from April this year when parents with dependent children get a $25 benefit rise). Moving into work may provide little financial gain initially. But the individual's sense of well-being and future prospects are improved. In this instance the ex-beneficiary has already identified that. Good for her. There is a large percentage of my clients who approach our service and ask us to look at the viability of returning to work -- single parents who are committed to getting off benefit and excited about the prospect of returning to work. When we break down the in-work tax credit, the childcare subsidy, accommodation supplement and temporary additional support, it is not uncommon that the working single parent ends up with under $50 a week more in their hand. We then look at transport, parking, appropriate clothing etc. for work. Work and Income will assist with a percentage of this cost, however, not the total cost, which then gets taken off the $50. Then, school holiday programmes need to be paid for along with childcare, which is subsidised, and the $50 in hand is reduced further. Given this, most of our clients still opt to return to paid work because we can see the benefits of work experience which may lead to better work opportunities. However, this does not provide a living wage and the extra expense of working does not often make this a sound financial choice. What can be done? The in-work tax credit for low-income earners needs to be increased, childcare needs to be free for low-income earners, including after-school care and holiday programmes, the living wage needs to be adopted by employers and the Government. The benefit is not a lifestyle choice, but when the income paid to working families is equivalent, we need to have a close look at incomes, rather than increasing subsidies. I notice the second op-ed well exceeds 200 words.There is something symbolic about that but I can't quite put my finger on what it is. A Blenheim single mother of three has found she is only $34 better off working. "I love my job. It makes me feel rewarded." So what is the point of this piece? 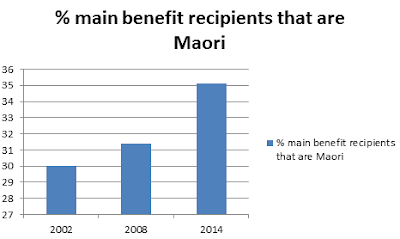 It's headed up "Blenheim mother of three struggling to survive after coming off the benefit." Her main problem is that 57% of her income is going on a mortgage. Lucky her. She 'owns' her own home. Most people are moaning because they can't get on the first rung of the property ladder. But perhaps she could reduce the repayments? "We struggle but we survive. 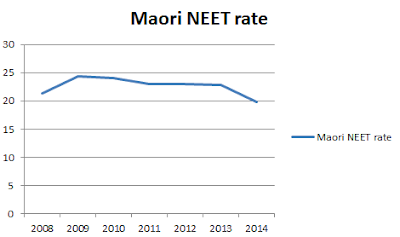 In Marlborough the gap between the low income and the high income is horrendous. The rich get richer and the poor get poorer." The journalist tries to give this some supporting data. 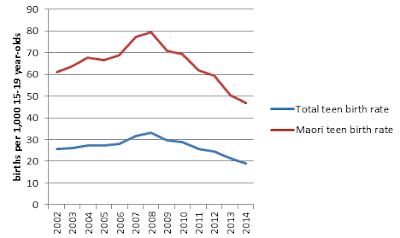 According to the 2013 census data the median income in Marlborough was $27,900, compared with $28,500 for all of New Zealand. Nearly 23 per cent of Marlburians aged 15 years and over had an annual income of more than $50,000, while 36 per cent earned $20,000 or less. Proving what? In among the 36 percent are dependent children, students and a disproportionate number of elderly. It's Marlborough. But a comparison to earlier census would be needed to prove a growing gap. Ministry of Social Development figures showed those on main benefits in Marlborough had gone up slightly from 2237 in December 2014 to 2265 in December 2015. But down 14% from 2,638 in December 2011. That's inconvenient. I am not without sympathy for the family. It is tough on kids having very little disposable income. But they live in a great part of the country, they eat well, have housing security and most importantly, prospects. That doesn't happen when you stay on a benefit. Only if you can work and won't. As I said I don't get why this is newsworthy. It's just more resentment fuel for the inequality insurgents. 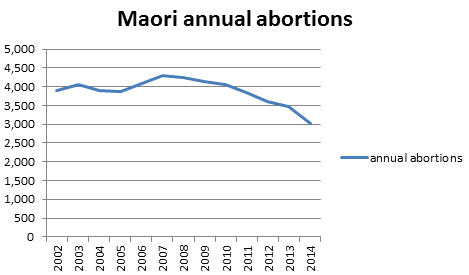 What has National done for Maori? With Ratana celebrations looming some are saying the church's loyalty to Labour is still strong and National needs to show what it has done for Maori. All govt should be 'doing' for people is creating economic conditions and freedoms that allow them to 'do' for themselves. 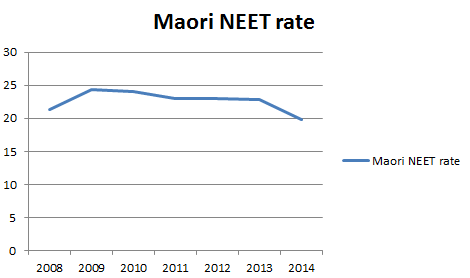 Nevertheless, that doesn't preclude looking at social indicators under National. I'll aim for 2002 to 2014. The first half under Labour - the second under National. No cessation of steady rise between 2006 and 2013. 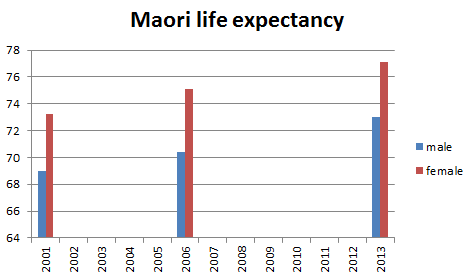 This data is is only available from 2008 but the trend is at least positive. In fact a lot of the Infoshare data now appears to only date back 7 or 8 years. Frustrating. There are far more social indicators but the data isn't particularly easy to access and graph quickly. Based on the above snapshot there isn't a lot that Ratana followers could gripe about that they wouldn't have griped about under Labour.